What Did the Real Madrid Leave behind for Asia? At Sunday night the Real Madrid ended its half-month Asia tour in Thailand, which can be called a travel, a performance and a business show. But for the Real Madrid players and coach perhaps the most precise term of description should be a pre-season training and a not easy one. Compared with the China tours of AC Milan, Sampdoria and England a few years ago, they turned out to be more a sightseeing object rather than sightseers themselves. The result of the training, no matter what it is, can by no means blemish the splendid demeanor of a professional player-group displayed by Real Madrid super stars. Of course, being "professional" not only includes respect for fans, earnestness in training, but observance of game rules, or, in more plain words, the coordination with their boss and sponsors in a grand commercial activity. The gap between Asia teams and the Real Madrid in play ground has long ceased to be a secret. Players from the Dragon Team and Hong Kong United, who are lucky enough to pit their skills against those super stars, should firstly put aside their inferiority and complacency and think hard over their gap with the Real Madrid. For a football market fully commercialized, a professional player should be clear about and play well his role, as the example set up by the Real Madrid. It is clear that we are not coming for economy aims, we have responsibility to provide a face-to-face chance for fans outside Madrid, argued Real Madrid president Florentino Perez when facing with criticism from AFC General Secretary Dato' Peter Velappan. Perhaps the football boss is too rich to take account of the profits of the Asian tour as something, but his remarks of not coming for money fools no one. So there is only one interpretation for Velappan's anger, that is, the question of Madrid is how much it earned, but not whether it earned or not. No one believed in Perez's remarks, for Real Madrid's plan in Asia also proved its economic aims-Madrid club cooperated with Asia Sports Development and signed a six-year agreement. During the first three years Madrid will at least get a profit of 22 million euros, which may be raised to 40 million euros if the operation is successful. 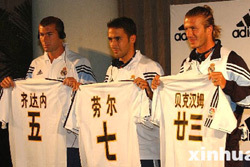 Asia Sport Development is responsible for promoting Madrid brand in Asian regions during the six years. The two sides would join hands in forging Madrid club's franchised stores, restaurants and cafes in Asia, and Madrid football schools will open. Meanwhile Asia Sports Development will developing sales of Madrid franchised products by way of new techniques. Never to doubt the brain of a businessman, for all the businessmen and experts who live on football directly or indirectly share an unspeakable belief, i.e. to keep the large football machine running, no matter whether they are Madrid, AFC, Asia Sports Development, or Real's China tour organizer GreatGate and sponsors as tobacco and beverage producers Hongta and Jianlibao. Under their joint operation Madrid's Asia tour has become one of the most successful business case. A time when everybody may become a football "fan"
Sports have become one of the most magnificent spectacles of our time, even though you are only a TV viewer who never enters a playing ground. The period of non-profit sports has long receded into history. But the fact doesn't prevent you from drawing great pleasure in a moment of action, a miracle coordination. If you can appreciate c Beckham's long ball, Raul's swiftness, Figo's breakthrough, Carlos' violence and the melodies under the feet of Ronaldo and Zidane, then you have really enjoyed the best they could offer.